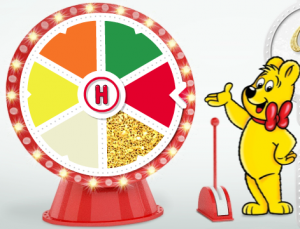 Spin the Haribo coupon wheel and receive a coupon, and 1,000 daily winners will receive a coupon for a Free product. Simply head over to the Haribo Facebook page to play. Limit of one coupon per Facebook account. Valid through 3/1/2012. Read the full listing of details in the “Official Rules“. Enter to win a Ultra Lift 2-in-1 Wrinkle Reducer Serum + Moisturizer from Garnier! Simply, submit form for entry. Entry limit is one entry per person with bonus entries for referrals.. One prize per household. Valid through 3/9/2012. Read the full listing of details in the “Official Rules”. Entry limit is one entry into the applicable Entry Period drawing. One prize per household. Open until 10/15/2012. Read the full listing of details in the “Official Rules”. Actually, if you win it’s a BOGO coupon.